With the PM backing the POSHAN (Prime Minister’s Overarching Scheme For Holistic Nourishment) Abhiyan, launched in March from Jhunjhunu, the usually elusive “convergence” of effort by relevant ministries becomes somewhat easier. The best thing in the prime minister’s Independence Day speech this year was committing his government to a Kuposhan (malnutrition) Mukt Bharat. The way he articulated it — “main bechain hoon, main besabr hoon, main vyakul hoon”— it was like making a vow and the country will hold him to that commitment in the months and years to come. Even better was his “samvad” with grass roots functionaries last week — aanganwadi workers, Ashas, ANMs — and it was the first time a PM had spoken directly to them, appreciating the work they did to save the lives of women and children, and announcing an increase in their emoluments. You could not miss the political implication of that outreach. Though he spoke to 3,000 frontline workers — addressing their leaders by their first name, his connect was something that is worth a study — it is bound to have a ripple effect. There are 34 lakh frontline workers, and each impacts, on an average, 250 families. That one event was geared to reach out to 340 million people. Politics aside, for the first time, Narendra Modi has put his political weight behind combating malnutrition. With two out of five children in the country stunted, and given that irreversible damage can be done in the first two years of life, there is no future-India unless an all-out effort is made to address the problem. Given his experience in Gujarat as CM, Modi knows this is no easy task. With the PM backing the POSHAN (Prime Minister’s Overarching Scheme For Holistic Nourishment) Abhiyan, launched in March from Jhunjhunu, the usually elusive “convergence” of effort by relevant ministries becomes somewhat easier. The turf battles between the Health and Women and Child Development departments have been legendary. The chief ministers, at least of the BJP-ruled states, have been called to order — and these are the states in the Hindi heartland where a bulk of the problem lies. The otherwise toothless Niti Aayog must be commended for the speed with which it readied the just rolled-out action plan for “September Maah”, to focus on poshan, mobilising different sectors, developing and standardising advocacy materials, targeting the service providers, roping in all those agencies which have been working on the issue for decades — be it Unicef, Tata Trust, IFPRI or others. The idea is to create a “buzz” around poshan. 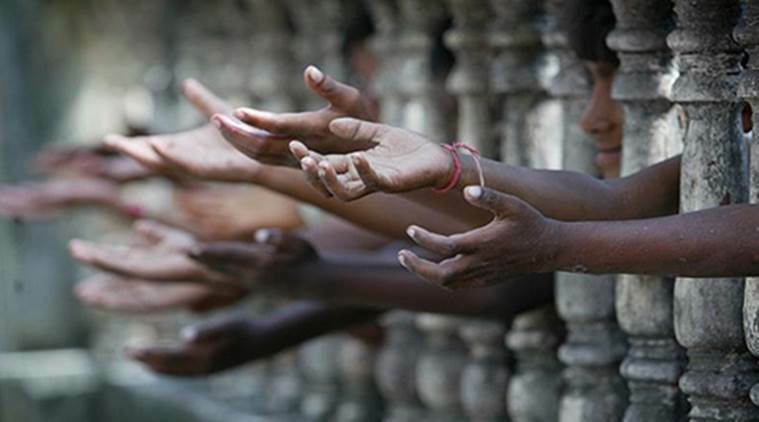 While the government has set yearly targets for itself, like a 2 per cent reduction in stunting and underweight children, or a 3 per cent reduction in anaemia (7 out of 10 children in India are anaemic), it will need to track progress closely, and consider a yearly survey instead of the six-yearly National Family Health Survey (NFHS). Given the district level data now available (in the NFHS 4), it should also be possible to get a nutrition profile of every Lok Sabha and assembly constituency, and this might enable poshan to become a poll issue. I had once asked a UN expert why the malnutrition figures in India were worse than those of sub-Saharan Africa when we are a democratic country and a fast-growing economy. His answer was simple: “More underweight babies born to more underweight mothers.” Mothers are underweight because there is a high level of anaemia among women (55 per cent). They are married early, they produce children at an early age, there is not enough spacing between children, they get “bacha-khucha khana” at home, there is a high dropout rate from school. Viewing nutrition as an issue concerning only “food” is one reason why we — including Modi in Gujarat — had not made the headway we hoped for, even though the ICDS has been in existence since 1975. All this is now known, and the prime minister’s words made this amply clear. There is another reason why the problem has persisted. Child malnutrition does not disturb us as it should. This is despite 115 million children in India — almost double the population of UK, or France, or Italy — being anaemic and malnourished and susceptible to cognitive problems, something that is bound to affect their productivity as adults. The government appears to be stirring itself. But it cannot be left to it alone. Some years ago, Aamir Khan had made a film called Tare Zameen Par. It brought about an attitudinal change towards dyslexic and special children, and what they were capable of doing. A film on this dream, called a Kuposhan Mukt Bharat, is now waiting to be made. So is an anthem on poshan, waiting to be sung by all the aanganwadis, in fact, hummed by the whole country. Three assembly elections — Rajasthan, Madhya Pradesh, Chhattisgarh — are around the corner. Some headway has been made in these states, but will the BJP and the Congress include in their manifestos the promise to create a “kuposhan mukt” Rajasthan, Madhya Pradesh, and Chhattisgarh? More important, to prepare a detailed action plan on how they will go about it if they come to power? This is for you, Sachin Pilot and Vasundhara Raje Scindia, and for Messrs Shivraj Chouhan, Kamal Nath, Raman Singh and Bhupesh Baghel. Could the President persuade the Governors to be more proactive in putting their weight to get a new deal, for, particularly, the Dalit and tribal children, who are at the bottom of the heap? Governors are anyway supposed to report regularly to the President under Schedule Five (covering tribal-dominated western and central states) and Schedule Six (for the north-eastern states) of the Constitution about the progress being made for tribals in their areas. We now know “what” is to be done. The challenge is to do it on a scale not attempted before. There are moments in the life of a nation which, if seized, can result in a quantum leap. If missed, they do not come again, at least not for a long time.